If you haven't seen us since Fall 2010, we've relocated! Dr. McNamara offers over twenty years of focused facial experience, having helped thousands of Washington D.C., Maryland, Virginia and international patients to achieve their dreams. Dual Board Certified, Dr. Scott A. McNamara has the additional distinction of being the first Board Certified Facial Plastics and Reconstructive Surgeon in the Washington, D.C. area. 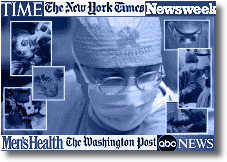 Dr. McNamara has also been Board Certified in Laser Surgery since 1983. Non-invasive facial rejuvenation treatments, minimally invasive procedures as well as classic cosmetic and reconstructive surgeries are Dr. McNamara's expertise, with his highly specialized practice dedicated entirely to the face. Our mission is to make your facial rejuvenation experience all that it can be. Dr. McNamara's practice also encompasses patient care in Head, Neck and Facial Plastic Surgery and ENT (Ear, Nose and Throat) Services as well as severe physical trauma cases. Performing arts & celebrity vocal consultation and care. Dr. McNamara's extensive experience and leadership with endoscopic and 3D image guided surgery technologies is renown.